Discussion in 'GMC Jam' started by Alice, Jul 14, 2016. Another thing that's not really a general complaint but general advice... don't throw too much controls info in the player's face at once. Moving around, jumping and one or two actions is about as much as you can handle from the get-go, if there's more controls than that you should introduce them via tutorials or text popups after the player's gotten a chance to learn how the previous ones work, ideally being FORCED to use them before proceeding. Mario games almost always start you off at the left side of a screen with nothing on it, forcing you to go right... at that point you know how to walk and how to progress (go right). Then once you know how to move right, an enemy approaches. You need to figure out how to jump to progress - either jump ON the enemy, killing it, or jump OVER it - in either case, it's completely impossible to progress further without knowing how to jump. Another great game I've discovered which takes this to heart, and which have had me playing it over a couple of times just because it is so nice, would be Dragons Wake. One hour left to place your votes! Please gather your rankings and post them while you can. That's particularly true for top 3 with comments; without that, the vote is invalid! -It seems to randomly freeze; usually when sorting games. -Not sure why it doesn't just autosave. -I sometimes find myself accidentally sending games to last place while scrolling. -Scrolling through games is annoying. The voting topic is now CLOSED! In order to comply with what has been written in the main discussion topic post, I'll now do my best to deliver the results within 24 minutes. Please wait warmly until that happens. If you have some last minute last minute votes, please send them through a conversation now. As in, literally now. I might or might not accept the vote, depending on how much time has passed. TheUltimate, Mercerenies and Detective Pixel like this. But first of all, I'd like to thank all of the participants and community members who made this Jam happen. Without you, your entries and your votes, it wouldn't have been such a wonderful event. I mean, really. With 81 entries submitted during the Jam, about hundred of participants and 44 valid votes, I think we can safely claim this to be the greatest Jam we have ever had. It's really astounding what we have done here. Now then, without further ado, the results! Special mention goes to @ghandpivot for making a video review of every single game, as well as @TheUltimate whose feedback is particularly detailed. Finally, I can't thank enough the people who took their time to play and comment on every single entry. The other votes are appreciated as well. As promised, the top 3 entries as well as best-of winners get a special, shiny banner to put in their signature. All the other entries get their banner, too, just not as special nor shiny. In total, there are banners for all 82 entries sent for this Jam, as well as for the best reviewer. Furthermore, the top 3 winners will choose the themes pool for the next Jam. If the themes end up bad, it'll be their fault. Fuzzy_420, shadowspear1, Electros and 16 others like this. 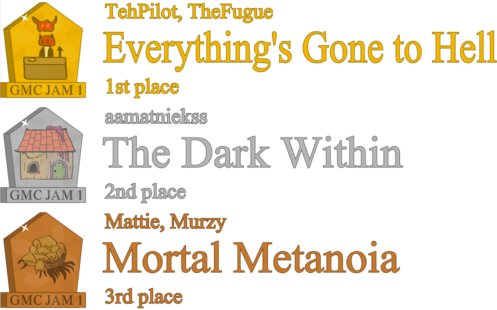 Congratulations TehPilot, TheFugue, aamatniekss, Mattie, Murzy, and everybody else! What a great Jam that was. aamatniekss, TheFugue and TehPilot like this. That was not 24 minutes. I am disappoint. So... When's the next one? I'm eager to get going again! Congrats to the winners and awesome job to everyone! Even if your game is very low in the ranking, you at least completed it enough to submit it, and that is definitely something, and yes I'm being serious. I hope everyone will check out the feedback they got on their games. I encourage everyone who hasn't played all the games to check them all out. There are some gems in there for sure. And now that it's over, I can finally focus on finishing my own game. Thanks to this jam, I got a nice solid start on making a game that I'm excited about and I learned some new GML magic. A BIG thank you to all involved in making this jam possible. The GMC Jam is officially finished! Whew! The voting was more exhausting than the Jam itself! Good job everyone! And Congrats to the winners! You guys deserve it! Fun stuff that! Good work everyone! Congrats to the winners! And as always, thanks to Alice for hosting this Jam! I hope that humble spreadsheet will at least partially compensate for that prolonged waiting. Generally, that's why there are two sizes available - 100px one for signature, and 200px if you want, I dunno, feature it on your website, or just see the banner in more detail? Micah_DS and ConsolCWBY like this. Fixed it Alice, and thank you! Thanks everybody! I'm ecstatic about the result, and I want to specifically mention the spotlight put on @TheFugue's hard work. We've been working together since the old GMC Jam #11, and tonight we finally broke that ancient record of a second place tie (and took home a Best Of award as well!). As someone who's been trying very hard to turn my passion for casual game design into a more serious undertaking, this victory means a lot to me. I'll have a version with all the glitches reported during voting up later tonight. I achieved the very cool transition effect by programmatically changing shader values. I was originally going to make the waves faster and more intense as a transition, but instead settled on the wispy thing after it came from a programming mistake. I'm glad I chose to stick with it instead of doing the generic "heat wave intensifies" look. The main character and Lucifer are very slightly animated. It's a technique I've attempted before in other projects of mine - I make very small sprites (arm, leg, body, wing, etc. ), set the origin as the "pivot" point, and draw them all with code. I then assign the image_angle in each one to a sine/cosine formula, and have a variable that cycles through 0-360 constantly. I usually throw in another constant as an animation speed multiplier, and change that during movement cycles or other periods of activity. That gives characters the little bob/arm wave when idle or moving. I did this same technique to great effect in another game jam entry elsewhere - Eight Seconds (Until The Void Consumes You), which I'll probably make a thread here about it sometime. The jam release version disabled lighting when the option was selected, but did not actually stop allocating the surface memory for it. This caused some players to report crashes on really bad systems. Whoops, my bad. There were two missing walls in Level 4 in the release build. @ghandpivot's video features that oversight. You can also still do it with the zip/thread link. Go nuts. The player's movement speed is still calculated even when pressed against a wall or corner and not actually moving. You can hold the direction against the edge of a pit, then jump to ensure you cross the gap. I apologize for the really mean jump in Level 7, and I fixed that in a post-release version coming soon. Nallebeorn, ConsolCWBY, Siolfor the Jackal and 3 others like this. nvrogers and ConsolCWBY like this. I'll be sure to participate again next time - and I'll get first place for sure! [Insert lengthy story arc that ends in learning that the only true reward is friendship]. I want to thank everybody for their comments, I had a lot of fun with my first jam and learnt a lot. Like, contact your artist on the first day instead of late on the second day, and don't procrastinate too much. Barely made it to the top half, my own little goal! Congratulations, everyone! I'm real pleased that this jam was such a fantastic success. I always look forward to these things, Pilo and I have tonnes of fun every time they roll around. We've known each other for a long time and make a pretty solid team. Thanks to all the wonderful folks who organize and participate in these events. It was literally these game jams that brought me out of a really long writers block/depression funk. I found myself unable to write music (for a REALLY long time, we're talking months, over a year), because I would overthink every part of a song and never get anything done, and I would just end up with a million unfinished song projects, and then feel all horrible because I work so hard writing music and have nothing to show for it. Then when we started really participating in these jams (and working on other projects together), suddenly I had a theme, a deadline, and a bunch of drive to complete something in such a short time, and I would actually have something at the end of it! Suddenly I had some music to show for all my hard work, and that really brought me to a better place mentally. Now I'm churning out music like nobody's business and haven't seen a lick of depression in months. So yeah, thanks everyone! And thanks @TehPilot for being an eternal bro, comrade, gentleman, and scholar. People seemed to like my earlier breakdown of the music so I decided to go to town a bit under the spoilers. Excuse my sleep deprived babbling (I've been awake for over 28 hours now and it might see some revisions in the morning). If you stand near the hot coals, flames shoot up. If you're close to the flames, you can hear them go "pshhhh, pshhh". I had an old can of compressed air in my room, and i sprayed that into my hand and moved my hand around to get the "pshh" noises. Jumping and landing is literally the sounds of me jumping and landing noisily (as opposed to what they were originally going to be, a classic BOOOIP jump sound, but we decided to go for a more realistic sound effect approach for the game). I tried recording in a bunch of different rooms in my house, and ended up recording in the basement, on top of planks of wood so it would actually be audible and clumpy. However, when I got them on the computer, I decided that the "jump" sound actually felt more like a "landing" sound, and the "landing" sound sounded more like a "jump" sound, so we flipped them in the game. The sound of the pressure plates is incredibly subtle. It's made up of scraping rocks I had on my desk (I KNEW I kept those rocks for some reason), the sound of the pedals on my piano beind depressed heavily, and kick drum samples from a song I made. The "success" sound when you give all your papers to the demon is the sound of ascending minor thirds. There are WAY more SFX in this game than there sounds like, because there are many different variations on the same sound. The most obvious examples is the "barbarbar" noises which are randomly selected for dialogue noises (there are 10 different human babbles and 5 different Satan babbles), but most sounds in the game that are repeated often have multiple different possible sounds, and sometimes different combinations. For instance, when you pick up a stack of paper, two sound effects play, a paper rustle and a "hup" vocalisation. There are 5 rustles and 5 vocalisations, which makes 25 possible combinations. Hilariously there are also 8 different flame jet noises, despite the fact that you probably never even heard the flame jets since you spend so little time beside a coal pit and it has to be right beside you to be audible. The main game loop is called "The Bureaucratic Nightmare". Officially, the title theme is called "For The Repose Of The Soul" but the file name is called "asdfgdsdgfdghftyrrtyhgtyhythF***MYLIFE". I'd upload a picture but, you know, swear words and I'm too lazy to censor it. In one of our previous game james, I experimented with fading soundtracks. Because of the mechanic of that game (three possible states you could be in), I wrote three totally different songs that were the same length and followed the same chord progression, so that they could fade seamlessly into one another. I decided to revisit this concept again with this game jam, but in a slightly different way. This soundtrack slowly advances as you progress in the game. There are actually a maximum of three musical tracks playing simultaneously. The "base" layer is a layer of ambience. The second layer adds on a PHAT HIPHOP BEAT YO with thwumpy 808s and all that. The third layer adds melancholy electric pianos and a Pink Floydian guitar solo. I made these layers with the intent of adding more progression to the song. The ambient layer, by itself, is pretty ominous and creepy. It's got weird percussion, and odd sound effects and such. Creepy. BUT, when you drop in that PHAT HIPHOP BEAT YO from layer 2 (on top of the ambient layer), it sort of transforms the way the track sounds. Instead of being ominious, it suddenly gets a drive to it, despite playing all the same audio as before. It's similar to the effect you can get by playing a chord over a bass note, and then playing the same chord over a different bass note - the chord is the same, but the relationship it has with the bassline can totally change the vibe you get from the chord. Then, when the third layer comes in, it makes everything sound a lot more pensive and melancholy. This gives the impression that the song is a LOT longer than it actually is (about 2 minutes and 30 seconds). I didn't want to fade new tracks in as soon as you change levels - the effect suddenly becomes obvious if you fade it in, you'll go "oh some new part is fading in". I wanted the effect to be very organic. SO, I picked natural points in the song at which the new layers are allowed to jump in. For example, at 20.38 seconds in the song, there begins a new section. This is one of the points where the "beat" layer is allowed to jump in, at a natural rest point in the song. If it faded in at an unnatural point (like halfway through a progression), you'd really notice it, but because it jumps in at a natural point, it feels really organic, like the song was supposed to be composed this way. Here are the breakpoints if you're curious, in seconds down to the centisecond (which was the highest resolution we could draw from Game Maker's audio engine). When the game recieves the trigger to add the new layer (from level changing) it waits until the songs playback position is between any of these values. The audio files actually don't end off on a centisecond mark, so (theoretically, I haven't tested it) these breakpoints will actually drift out of accuracy if the song loops enough times. The song layers using Game Makers synchronised audio function so they will never be off time, but the fade ins have the technical potential to fade in at a point I didn't intend them to. A lot of sounds on the ambient layer are sounds from my field recording collection and sound effects I made for my psychedelic music tracks. One of the percussion loops I lifted from an earlier unfinished psytrance track I made. The percussion was made by whacking a pencil against a hard drive cage - when I was building my production PC, I mined an older computer for parts, and now I just have a husk of a computer sitting there. You could see it as a hunk of junk that is lying on my floor being a mess, but I see it as percussion potential! Speaking of which, this song marks my debut of actually using a real percussion instrument in a track ("real" being defined as something I personally recorded, not a sound library, and that that something was meant to be an actual instrument... not like, a hard drive cage). It's subtle, but in the latter third of the track, you can hear hand drums in the background. Those are djembes that I had kicking around my room waiting for a real microphone to be bought (although there are some not real djembes on this track too, before I rememberd that I could just record them). -Some random vocal noises I made with LOTS of reverb and a gate on them, probably also processed with granular synthesis or intentional buffer underrunning or something. -Mechanical noises from a 3.5 floppy reader. Maybe also modem noise? I can't remember. -Various impact sounds I recorded in a warehouse while I was in Norway (It was somewhere near Bergen. One of my cousins took me on a drive out to some weird warehouse where I met all his friends. It was sketchy as all hell, but I got them to bang on sheet metal and stuff and I recorded it. I think I also recorded rain on roofs while I was in Bryggen with my cousins). I decided to post the song. I've put the three combinations together into one track, which repeats three times - once with the ambient layer, once with the ambient+beat, and once with the ambient+beat+instruments, and packed it all in a nice little mp3. I also posted For The Repose Of The Soul. In the folder, I also included the different layers for Nightmare, if you're curious to hear what they sound like alone. Be warned that the only layer meant to stand up on its own is the ambient layer, the other layers sound pretty empty at times, but it is pretty interesting how they sound by themselves (I never listened to them by themselves until just now, hahaha, I only listened to them in context). You're free to download this music for personal listening only. Please don't use them in anything without my permission. If someone cares for a lossless version, I'll post them up as FLACs or WAVs. Feel free to ask questions if you have any. I love talking about things. shadowspear1, Detective Pixel, Alice and 3 others like this. Thanks for the badge, I love that they're all personalized that's amazing!! It truly was a fun event and I'm glad I got to participate!! Wow, I didn't expect us to be even in the TOP10. This was my first real game jam I participated after all. Huge thanks to everybody who reviewed or commented on our game. All the feedback have been really helpful as we've continued to develop the game. I'm happy with just about getting into the top 20. It was a personal victory of mine to even make something playable in the time and gave me a fun new project to expand on and release in improved form later on (those who follow my Twitter have likely seen a couple major additions). Congratulations to everyone for even submitting something and of course the winners for being awesome and the reviewers for taking the huge amount of time to go through and rate everything. This was my first ever Jam. It probably won't be my last now I have a good idea of what's possible and what's too ambitious in the time frame. Awesome! This is the kind of thing we want to hear! Your game was great, and I'm looking forward to playing the updated version (like the mini-game intro idea... very nice!). As for everyone else, yep, been a great Jam and I'm glad I participated. I really bit off more than I could chew this time around with my game. Most of the reviews I got were 100% spot on... BUT I will say that it was actually VERY related to the Everyone is Dead theme... It's the future and humanity has been consumed and turned into memory crystals by an all powerful AI that they created (they are more "efficient" as memories than as people). In the game you play a rogue AI that wants to "farm" these memories to improve himself and eventually become the dominant AI in the galaxy. However I spent so long creating the room wrapping defender mechanic that it left no time for the finer points like story or sound... and the game should have featured a major upgrade tree where you could use the memories farmed to improve your ship. It was a fantastic jam to take part in, can't wait for GMCJam 2! Congratulations to the winners! Ohh, cool, 2nd place in 2nd jam in a row! Thanks a lot for voting everyone. And congrats to the rest of you! Congrats to TehPilot and The Fugue for the first place, you made a really good game! TheFugue and TehPilot like this. @TheFugue Really interesting music breakdown and also a really interesting, unique score. I love reading analyses like this. Seeing the spreadsheet - It looks like participants get punished if their game was rated highly by someone who chose not to review all the games. Is that right? Example: The person I gave third place got 0.238 points, but someone gave me third place and I only got 0.05 points (presumably because they only rated their top 3). Far from the possible intended effect of motivating people to rate more than three games, all this does is give me an incentive to rate fewer games next jam so that I'm not giving other people a massive advantage over myself. What was wrong with 1/vote? With the Jam ended and new things tried out, I'd like to ask you people, what do you think? What things worked well and what could be improved (or removed altogether?). Please keep in mind that there were quite a few major changes whose effects are hard to evaluate after just a single Jam, so unless there's an overwhelming support to scrap them, they'll probably stick for at least a few editions (we prefer not to change key aspects too often, in order to avoid confusion). What was wrong with 1/vote? On the old forums, there has been quite a debate unlike other voting system debates, because it actually ended up with something productive. Following the comparison of voting system results, people concluded that the current voting system (normalised 1/rank+1) is the best of proposed, and overwhelming majority of people was in favour of scrapping raw 1/rank in favour of one of alternatives. Also, I dunno how about others, but I don't really consider the advantages or disadvantages here when ranking the games. I just do it for the sake of it, so that others might gauge how I liked their game compared to others, or something, and I generally like when others do that in return. Guess I'd rather do my ranking properly and end up a few positions lower, rather than give up on some quality feedback and evaluation here. My only complaint about the jam player was I wished the instances inside resized completely with the window, there seemed to be a limit to how large they could be so when I maximised it there was a lot of wasted space. Mainly wanted that so I could see my rankings better and not have to scroll as much. Alice and Micah_DS like this. My suggestion for the jam player is being able to customize categories, eg. Gameplay, presentation, etc. An ability to add categories would be even better. Nallebeorn and Alice like this. (BUG?) When a Readme file had the word "readme" and not "please", the button itself would not be lit up green, but the button text would be, but if both words were present in the file name, both the text and the button were green...? Is there reason for this or is it just a bug? When moving unranked games to rank them, it would've been a very nice option if there was some kind of shortcut keypress+click to immediately move an unranked game into the next spot of the rankings list, as opposed to having to click and drag the titles each time. I really think this would be a useful option to speed things up and make it less of a hassle in general, as I had to keep scrolling the ranking list to be sure I was at the bottom, then I had to drag and drop the game at the bottom of the ranked list (I systematically ranked from first to last rank, so I was always placing them in the next position). It's already pretty nice, but this would make it a lot better, imo. As already suggested, a prompt to save before closing would be good. Or an auto-save, if that seems better to everyone. Allow the Jam Player UI content to scale as big as the window gets. Currently, it limits itself and there's a bunch of empty space around the edges. 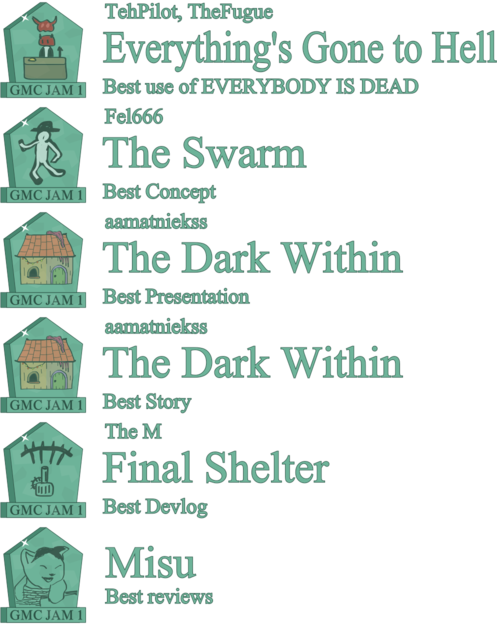 It would've been really nice to utilize my entire screen, mainly so I wouldn't have to scroll so much through all the jam titles. So I guess I'm just seconding what @Siolfor the Jackal said. That's all I can think of. The Jam Player was VERY useful, btw. It made the process oh so very nice. I can't imagine trying to do it without it. Most notably, being able to type in the names of the games to go directly to them in the lists was AWESOME. You have no idea how helpful that was for me to do things faster. I think this goes without saying for most people, otherwise we wouldn't sit down and rate 80 games at the expense of our own (like I did this time). But obviously people here do care about the tactical side of voting at least a bit, otherwise we wouldn't have introduced bizarre numerical measures to "even out" the scores. My main gripe with this is that it "punishes" both the voter and the entrant by weakening voting power and the weight of each vote. Even if someone plays & reviews more entries, but only rates their absolute favourites, their vote will count for less. That doesn't seem fair. (I don't say this out of self-preservation, under 1/vote the top 7 places would be the same as they are now, it just feels wrong to me in principle). Maybe I'm overthinking it, but tbh that's what it feels like this voting system does. It overthinks the jam, and saps the fun out by implementing a system of punishment for those who don't play the full roster of games. :/ Merp. @Alice I think the Jam player would benefit from an auto-rank feature based on what you rate the games in the several categories (you could also add the ability to customize the several categories available and their weight on the final score). So, 20th place. I'm happy with that, though it does bother me a bit that a performance issue that was so ridiculously easy to fix (I admit there's a lot of room for optimization in my game, but getting acceptable performance would've required just a simple fix) seemed to have affected a few players very much... and probably pushed me down a few places. Well, well, lesson learnt I guess. Ah, yes, I actually kinda felt the windows become too large when scaled on my display, but I guess it won't hurt to remove the limitation altogether (it's actually easier than imposing it). Yeah, own categories is on my list. It might be a bit tricky to setup, especially in a way that feels intuitive for you guys (some early Jam player predecessor from many Jams ago involved tinkering with XML files), but I think I can handle it. With the time I had this Jam, I mostly focused on making the player simple then functional (rather than overwhelming people), but I guess till the next Jam I'll have time to plan it better. I have some experience with algebraic/boolean expression parsers, too, so you might be able to make auto-ranking criteria like rui.rosario describes. For example, "sort descending by Overall", or "sort descending by 2 * Gameplay + Graphics + Audio" or "sort descending by Fun rating, then by Theme rating". I think something like this is more than enough for most Jammers needs. Another thing to make it complete would be support for custom templates. I have yet to decide their exact shape, but generally you would be able to define a custom format of a voting post, or maybe even multiple files to generate (maybe even an ability to generate a file for each entry)? Actually, it's a feature. Generally, README PLEASE files are intended to contain an information without which it'd be much harder or pretty much impossible to play the entry. So if you don't have time to make a help section in your game, but still need to include instructions, you use README PLEASE. Regular README files instead were intended as general information that the voter might or might not read (e.g. credits); not necessary to enjoy the entry. Since README PLEASE files are supposed to be more important than README files, they are additionally highlighted, similarly to the very important RUN button. I guess people haven't quite grasped the intended difference between README/README PLEASE files, but since it's the first Jam using specific support for readme files and I might not have made a clear-cut explanation about how these work, I'm not too worried. When moving unranked games to rank them, it would've been a very nice option if there was some kind of shortcut keypress+click to immediately move an unranked game into the next spot of the rankings list, as opposed to having to click and drag the titles each time. Guess that wouldn't hurt. Anyone has an idea for a specific hotkey? The prompt to save before closing should be already present in the most recent version (in the patch from August 10th). If it's doesn't appear despite you having made changes, it's a bug. As for the autosave, I guess I might add it eventually, as an option to turn on and off in Preferences (until now, I didn't really have time for any sort of Preferences). Maybe? I guess it won't be much of a trouble to add such a tooltip with brief description. It might be even easier to make it in a way that the earlier described custom criteria can have their own tooltips defined, too~! Most notably, being able to type in the names of the games to go directly to them in the lists was AWESOME. You have no idea how helpful that was for me to do things faster. But now that you mention it, maybe I can add a search text box below the ranking/unranked entries? But obviously people here do care about the tactical side of voting at least a bit, otherwise we wouldn't have introduced bizarre numerical measures to "even out" the scores. Actually, the "bizarre numerical measures" you speak of proves nothing about people caring or not about the tactical side of voting. They are introduced to minimise the adverse effects of people voting when not playing every entry, sometimes even going against the voter's intent. It's not about people voting tactically, it's about people not having time to play all games. With the raw 1/rank system, someone playing 10 games and ranking all of them could accidentally give a huge boost to the last-ranked entry, even if they hated it. With the current system, they still give a boost, but it's really tiny. We can discourage people from making incomplete ranks potentially making them give up on voting altogether, we can stick to 1/rank purity and accept the chaos around the lower places it wreaks, or we can use "bizarre numerical measures" to contain the chaos at least a bit, while not losing out on incomplete votes (and possibly really cool feedback coming with them). Out of these options, I find the last the most preferable, and going by the debate after Jam #20, others do as well. Oh hey, I thought those were only for the top places. Thanks a bunch for the banner, Alice! The concept is worth developing further, but it seems that more than 70% of the people who reviewed the game didn't play it the way you're suppose to and thus found it VERY hard (understandably). That's on me for sure, I'll need to work on the presentation and tutorial, which was made in the final hour of the jam. Oh, and @Blake, you can PM me if you want to claim your 4th place price. Who got @JackOatley's jam? Is anyone above me UK-based? I most certainly am. With the raw 1/rank system, someone playing 10 games and ranking all of them could accidentally give a huge boost to the last-ranked entry, even if they hated it. With the current system, they still give a boost, but it's really tiny. @Alice, you did a great job organizing this. Seriously. Everything was smooth and professional. And the speed at which you assembled the game zip folder, and tallied the results was amazing. I expect you'll be getting a raise in your moderator's salary. There were some great entries this time around. I'm happy with the top-ten places, even though some of my favorites didn't do as well as I hoped. But that's usual for the Jam. We all have different tastes. Well done everyone (OK.. almost everyone). HayManMarc, TehPilot and Alice like this. Alice, you did a great job organizing this. A voting system discussion... the true Jam spirit has migrated to the new GMC. The only viable solution is to calculate the Jam scores in every format discussed and/or utilized before, and then average the results. That only gives conclusive results if all formats have Gaussian properties (that complaint is moot if all voting systems ARE Gaussian, I'm not quite in the mood to look up their properties right now but from the complaints of the current system I would assume it's not), not to mention all elimination systems don't give clear 'scores', so it's not clear how to compare them with ranking/scoring systems, and if a scoring system was tacked onto them, people could complain that that system is flawed. At least normalization means we can't have Mandelbrot randomness... always something, I guess. Are we going down this road?